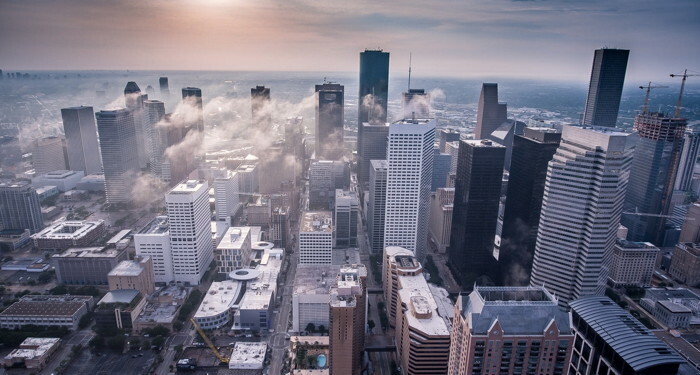 The most recent Lodging Econometrics (LE) Hotel Construction Pipeline Trend report, LE states that Houston has a total of 150 projects/16,473 rooms in the construction pipeline, the third highest in the U.S. behind New York City with 170 rooms/29,630 rooms and Dallas with 157 projects/18,954 rooms. 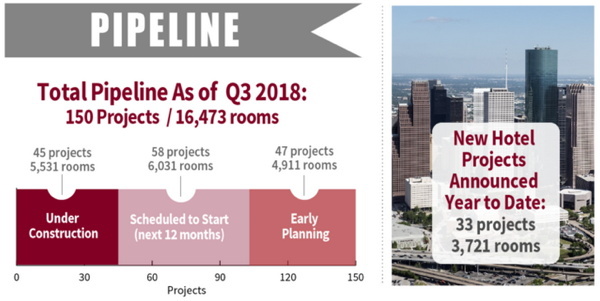 In Houston, 45 projects/5,531 rooms are presently under construction, projects scheduled to start construction in the next 12 months are at 58 projects/6,031 rooms, and those in early planning are at 47 projects/ 4,911 rooms. If all of the projects in the pipeline eventually come to fruition, this will increase the citys guest room supply by 19.2%. Of the ten market tracts in Houston, the three with the largest hotel construction pipelines are: the George Bush Airport area with 26 projects/2,606 rooms; the Southwest Freeway area with 20 projects/1,941 rooms; and the Eastern part of Houston to include Baytown with 20 projects/1,653 rooms. These three important market tracts combined account for 44% of Houstons total construction pipeline.